Florence returned to the US Top 1000 recently, after over three decades in hibernation. Will this former Top Ten favorite return to prior heights? This name sounds botanical, but there’s more to the story. It comes from the Latin florens – flourishing. The term implies prosperity and success. Florere means to flower or to bloom. That makes it part-nature name, part-virtue. I’d call it pure ecovintage. There’s the masculine Florent, too, as well as Flora, Florabel, and lots of other sometimes-heard Flor- names. But the -ence ending feels especially well-established. Plenty of us hear this name and dream of Italy. None other than Julius Caesar founded the famous city all the way back in 59 BC. During the Middle Ages, the city served as a trading center. By the Renaissance, it was a hotspot for the arts. The powerful Medici family called Florence home, and it even briefly served as the capital of the third iteration of the Kingdom of Italy. Over two thousand years after its founding, it remains a favorite destination. Places galore have been named after the Italian original. In the nineteenth century, the city of Florence welcomed the well-to-do Nightingale family – William, Fanny and daughter Frances Parthenope. Parthenope was named after her birth place, and when the Nightingales welcomed a second daughter, she became – naturally – Florence. Despite her family’s objections, the younger Miss Nightingale grew up to pursue a career in nursing during the Crimean war, revolutionizing health care and saving countless lives. She established the first professional school of nursing, authored the first textbook in the field, and made practical innovations that changed hospitals forever. That makes this name nothing short of heroic. While it is sometimes heard as a surname (think celebrity chef Tyler Florence), most of the time it evokes Nightingale’s courage, the romance of the Italian city or a botanical flair. Back in the nineteenth century, it became one of the most popular picks for parents. From 1887 through 1906, the name ranked in the US Top Ten. It remained in the Top 20 through 1924, falling slowly afterwards. By 1982, it had left the rankings entirely. Still, at its heights it was powerfully popular, and that meant nicknames galore. There’s Florrie, of course, but also Flossie. The Bobbsey Twins series appeared between 1904 and 1979, featuring two sets of twins. Nan and Bert were the elder siblings, with Flossie and Freddie the younger. I’m not clear if the series ever gave any of the four a formal name, but it seems likely that a Flossie born early in the twentieth century would really have been a Florence. Early Harlem Renaissance performer Mills. The lead singer of the Fifth Dimension, as well as a founding member of The Supremes, answered to the name. By the 70s, television featured two sassy Florences: The Jefferson’s fictional maid, and Alice’s fellow waitress at Mel’s Diner, Flo. The characters were lovable, even memorable, but they weren’t likely to inspire parents. Toss in Little Britain’s cross-dressing Florence Rose and the small screen has done the name no favors. But the generation that came of age watching those shows? They’re headed towards grandparent status today. And a generation is choosing names like Charlotte, Abigail, and Eleanor. It’s easy to imagine Florence joining the next wave of vintage revival girl names. The numbers bear this out. After many years’ absence, Florence returned to the US Top 1000 at #980. That’s a long way from the Top Ten, but it’s more than doubled in use over the last five years. A handful of edgy references boost the name. Indie rock band Florence and the Machine is fronted by a lead singer with the name. There’s an Argentine model called Flo Gennaro. Insurance company Progressive’s fictional spokesperson uses the nickname, too. Former UK prime minister David Cameron gave the name to a daughter born while he was in office; English actress Tamzin Outhwaite also welcomed a daughter by the name in 2008; and a handful of other famous figures have used the name. It all suggests that we’ll be hearing more of this name in the years to come. But for now, it’s early-stage revival. That means it might be the next Charlotte … but for now, you’re nicely ahead of the trend. 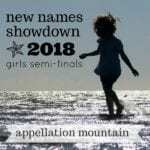 Do you think this name will return to the US Top 100 soon? Or do you still find it a bit dusty? Originally published on June 23, 2009, this post was revised substantially and reposted on July 18, 2018. My 3 year old is named Florence. At home we call her Flo or Flo Flo. At day care, she gets called Florrie. Her grandmother calls her Flossie. I think it’s beautiful. What a great name, Beni – thanks for sharing! My husband and I really like the name Florence. Though her nickname would be Laurie if we name one of our daughters this. I’d love to see an update to this post sometime! I love my name! I’m 17, and throughout my school days I have had a variety of nicknames, Florrie, Flossie, Flo-jo (which merged into Floj, then fuj… don’t ask) but never Flora. My friends and family mainly stick to Florence and Flo now. My mother named me after the city, coincidently she was watching a cooking programme set in Florence where the celeb chef was Tyler Florence while pregnant with me. I really don’t feel it’s an old granny name at all and I like that there aren’t 6 other Florence’s in my class. My name is quite special because my last name is Angelo, so it’s very Italian! But I also really love the name Fleur, if I ever have a daughter that’s what I want to call her. We just named our third daughter Florence Adelyn. She’s named after my husband’s grandma and my great grandma. Because it was important to us that she not be called “Flo” EVER, we wanted to have a nickname ready for her right away. We toyed with Flora and Wren, but ultimately decided on “Flyn,” which, we think, is a cute combo of her first and middle names. We weren’t totally sure about the name Florence in the beginning, but now we are loving it and it totally suits our little one. I love the idea of Florence Adelyn, nn Flyn – lovely mix of modern and traditional. Congrats on #3! Thanks for the info 🙂 I quite like Florence – I’d happily tuck her into the middle somewhere – Beatrix Ida Florence maybe?! – but up front i think I’d me more likely to use Flora or Fleur, as they do seem quite a bit fresher. Of all the flower names, this one is the least likely to get my vote. First off, I remember the Jeffersons’ maid. Secondly, the city – even though in Italy, it’s called Firenze. In all, it’s not a hateful name at all, and the -nce ending is interesting, but it doesn’t do much for me. I like names that sparkle; this one just simmers. Florence is okay. I can see its appeal for someone else, but it’s one that doesn’t quite appeal to me. My husband’s dearest grandmother was named Floris…apparently originally a Dutch masculine form of Florence, but I’m sure it seemed quite current among all the Gladyses, Dorises, and Loises, and Phyllises of the 1930’s. She hated her name because it was always confused with the significantly more popular Florence. We’ve thought of trying to honor her if we have a daughter. Problem is, Floris and Florence don’t quite appeal to us. Flora comes close, but it’s not quite what we want, and Fleur just isn’t me. And her middle name is Marie, which is just way too predictable. The best option we’ve come up with so far? Marigold! It has the “Mari” of Marie and the floweriness of Floris. Of course, it’s one that’s best used as a middle name only. I think I like Florence. I do not like Flo or Flossie. What about Rency? I think a little girl would have to grow into Florence. I love Florence. I had a great aunt Florrie whom I would love to honor. My husband’s not too keen – this one might have to go in the middle unfortunately. Florence appeals to me. When nameberry.com challenged readers to guess the name of Ben Affleck and Jennifer Garner’s newest addition the name I submitted was Florence (why? I don’t know). Thinking about the name, I’m not sure why it attracts me as much as it does. I grew up on Agatha Christie’s mysteries, and in her stories Florence is usually the name of a servant — implying that she considered the name lower class (along with Gladys and Ellen, which also frequently figure as servants). Additionally, I have known one Florence in my life and she turned out to be a thief. Still, it’s a lovely name, and on that I might even consider. Azhia, Violet and Florence do sound like a sib set – and actually, Tabitha and Marion are sort of in the Florence vein – kinda like Walter and Frank, too – hopelessly uncool until they’re impossibly cool again – just like so many names. Florence feels a bit cold to me. I much prefer Flora. I’d be remiss not to mention Florence Nightingale, a feminist who was waaay ahead of her time, whose legacy still impacts the scope of practice for modern nursing. Too bad the name and all its variations fall flat for me; like Mildred, Harriet, and Maude, I don’t see this one poised for a comeback. The nicknames Flo and Flossie don’t exactly boost the appeal, either. Florence sounds so dignified to my ears! I adore her (though I prefer Frances). Florece is a love. One of my Maternal Aunties, a real doll of a lady. I love the possibility of Flossie or Flora (for when she’s a bit older, perhaps, Flossie may lead to teasing). I even think she sounds pretty great with my surname! I’m still thinking on a great combo, haven’t got one just yet but Florence definitely has potential for me and I think anyone who can appreciate her many charms. Florence is awesome! Florence has real potential… great nicknames and a nice history/good namesakes to boot. 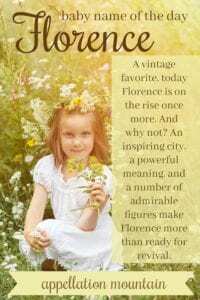 But, it still sounds a tiny bit old-lady to me… but I do go for the old-lady-chic names in many cases, so I’m sure Florence could easily grow on me. Yep, I like Florence. 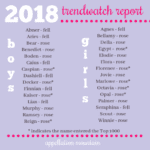 […] might explode if I read another lame attempt to connect Jersey Shore and baby names. […] and wife Samantha welcomed their daughter while vacationing in Cornwall – and called her Florence Rose Endellion in honor of her birthplace. […] to spot them in use regularly. […] amazing Toni Collette welcomed a son named Arlo Robert, a little brother for Sage Florence. 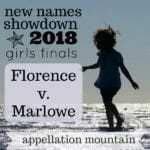 […] Loretta for one of her girls, and Appellation Mountain coincidentally featured Clyde, Marjorie, and Florence in the past three days.